A deal in which President Trump accepts an amnesty for millions of illegal aliens enrolled and eligible for President Obama’s Deferred Action for Childhood Arrivals (DACA) program in exchange for minor border wall funding would be counterproductive to the “America First” goals of the administration, depressing U.S. wages in the process ahead of the 2020 election. As Breitbart News has extensively chronicled, Attorney General Jeff Sessions ended the DACA program last year, although it’s official termination has been held up in court by left-wing judges. Since then, a coalition of establishment Republicans and Democrats have sought to ram an amnesty for up to 3.5 million DACA-enrolled and eligible illegal aliens through Congress, an initiative supported by the donor class. Such a plan, most recently, has been touted in an effort to negotiate a deal in which Trump receives anywhere between $1.6 tand $5 billion for his proposed U.S.-Mexico border wall in exchange for approving a DACA amnesty for millions. The amnesty would render the border wall useless, as it would not only trigger increased illegal immigration at the border — which is already set to hit the highest annual level in a decade next year — but increased legal immigration to the country. Last year, Department of Homeland Security (DHS) Secretary Kirstjen Nielsen admitted that even discussion of a DACA amnesty increased illegal immigration at the southern border, as migrants surge to the U.S. in hopes of making it into the country to later cash in on the amnesty. Kansas Secretary of State Kris Kobach previously predicted that a DACA amnesty would trigger an immediate flood of a million illegal aliens arriving at the U.S.-Mexico border. In 2014, when Obama enacted DACA by Executive Order, the temporary amnesty caused a surge at the southern border, as noted by the Migration Policy Institute. According to Princeton University researchers Stacie Carr and Marta Tienda, the average number of family members brought to the U.S. by newly naturalized Mexican immigrants stands at roughly six. 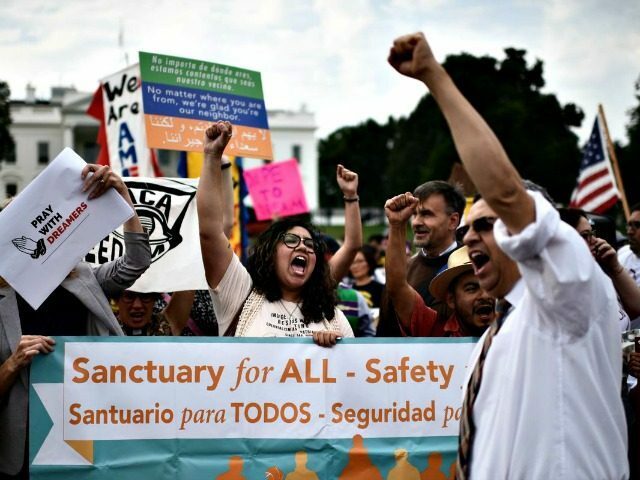 Therefore, should all 1.5 million amnestied illegal aliens bring six relatives each to the U.S., that would constitute a total chain migration of nine million new foreign nationals entering the U.S.
At this rate of chain migration solely from a DACA amnesty, the number of legal immigrants arriving to the U.S. with family relations to the amnestied population would potentially outpace the population of New York City, New York — where more than 8.5 million residents live. Should the goal of Trump’s proposed border wall be to reduce illegal immigration and eventually incentivize lawmakers to reduce legal immigration levels — where the U.S. imports 1.5 million immigrants every year — to raise the wages of America’s working and middle class, a DACA amnesty would have the opposite impact, increasing illegal and legal immigration levels. The president has also touted the wall as a benefit to American citizens in terms of cost. A border wall is projected to cost about $25 million, a tiny figure compared to the $116 billion that illegal immigration costs U.S. taxpayers every year. Meanwhile, a DACA amnesty would drag increasing U.S. wages down for the country’s working and middle class, delivering benefits to the business lobby while squashing the intended goals of the Trump administration ahead of the 2020 presidential election. The plan is also likely to hit the black American community the hardest, as they are forced to compete for blue collar jobs against a growing illegal and legal immigrant population from Central America.